For the last few weeks I have been reading through back issues of Mix to get a sense of how the magazine has reported on the development of digital sound technology in Hollywood. One article that stood out from the rest examined the theatrical re-release of the original Star Wars trilogy in 1997. Larry Blake, the author of the piece and a sound practitioner himself, confronted the whole question of whether or not George Lucas was committing heresy by tampering with the “original” films. Essentially, Blake found that even in 1977 there were multiple “originals” in theatrical circulation. This finding also supports my view that, in some sense, we can never really discuss any film as a text without variation. There are, of course, expanded releases, “director’s cuts,” “special editions,” “remastered editions,” and “restored editions” that alter the ways in which we can study a film. There are also more subtle variations that quietly subvert a totalizing view of film as text. We need to consider the aural and visual differences between a film’s theatrical presentation and its home video release. And as Blake’s Star Wars analysis suggests, we also need to consider how multiple versions of the same film can exist in its initial theatrical run. Calling attention to the heterogeneity of the film experience, Altman offers a film-historical approach that removes the need to refer to the film as a single phenomenon. Instead, we should embrace the multiplicity of spaces and versions of the cinema experience. To put this another way, Altman worries that by homogenizing film as a singular, unchanging text we miss an opportunity to explore the diversity of spaces in which films are presented and the various “social contexts in which the film is seen.” Specifically, he is pointing to silent film exhibition where feature films were shown with differing musical accompaniment or different ticketing and seating policies, thereby contributing to an altogether different experience of the same film. The modern exhibition environment offers the same variation, even if it is less obvious than silent film practices. There are first-run theaters, second-run houses, drive-ins, and countless combinations of home cinema applications that skew any sense of a singular film experience. Can we honesty say that a state-of-the-art screening of, say, Wall-E at a digital cinema will be the same at a run-down mall multiplex? Or during a screening geared at mom’s and tots? David Bordwell has recently noted that at such parent-friendly screenings the “theatre is a little more illuminated than normal, the sound a little softer.” This ties back to Altman’s call for film studies to incorporate broader parameters in the analysis of films. Indeed, we might learn more about film viewership and audience trends if we consider the conditions under which films are exhibited. One of the most understudied components is, of course, home viewing. When films were first shown on television, they were — arguably — poor imitations of what audiences experienced in the theater. In the post-widescreen era, films were truncated to fit on the relatively square-shaped TV screen, the audio mixed down to accommodate the puny mono TV speaker, and color films were often seen in black-and-white by home audiences who did not own a color set. By the time of VHS and Dolby Surround, home audiences were closer to experiencing the version of a film that filmmakers intended, but sound and picture were still augmented to accommodate the different platform. Even in the age of Blu Ray and High-Def TVs, mainstream films are translated to video in a complex process that often results in color and sound being slightly “off” from the theatrical (i.e., celluloid) standard. In recent advertisements, Dolby Labs tells us that their latest home cinema technology, Dolby True HD, offers unprecedented audio clarity to home theater buffs by including uncompressed “lossless” audio that mirrors what filmmakers heard during the mix. It’s an outstanding format, but Dolby and other home audio manufacturers have been marveling at their ability to “bring the theater into your home” for decades now. The tools may be new, but the offer is the same. Which is why it is important to consider that there is no tangible way we can achieve equivalence between home and theater viewing. This brings me back to Larry Blake’s Star Wars article. 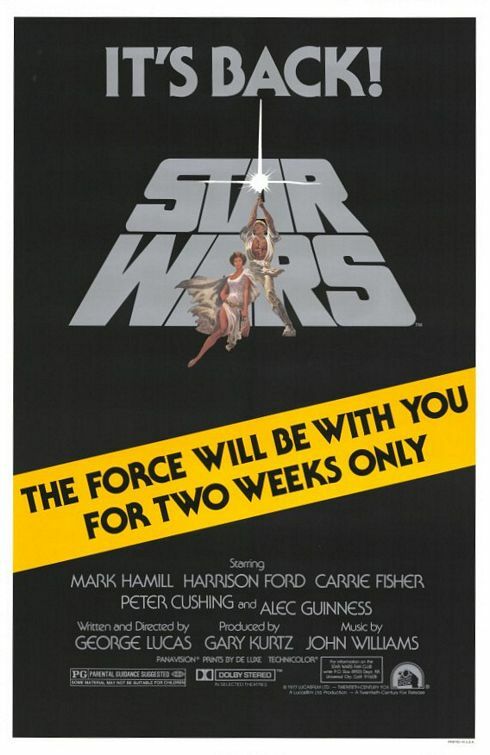 During the original release of Star Wars in May 1977 Twentieth Century-Fox released no fewer than four versions of the film to North American theaters. While audiences may have seen the same film, they heard three different ones. Star Wars was one of the first films to be mixed in Dolby Stereo and the very first film to employ a low frequency effects (subwoofer) channel, resulting in some very experimental mixing techniques. No one was quite sure how to best create a multichannel mix and the tools were not yet in place to ensure that the Dolby Stereo mixes were problem-free. By my count, there were four separate mixes readied for distribution: a 4-track master (LCRS, or Left, Center, Right, Surround), a 6-track version (LCRS+LFE), a 2-track Dolby mix (LR), and a mono track. The second mix the crew readied was the 6-track version with the added low frequencies for 70mm engagements; these were considered the roadshow engagements and numbered only 35 across North America. 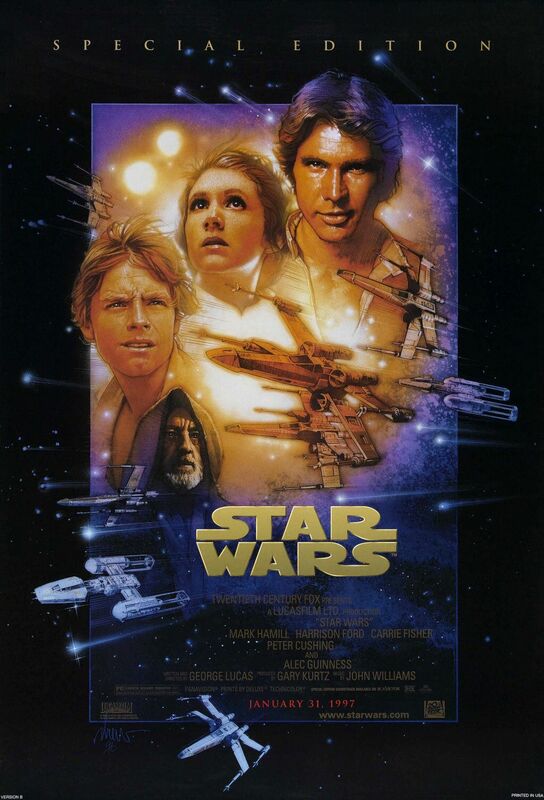 Thus, even before the 1981 re-release — wherein the subtitle “Episode IV: A New Hope” was added to the title crawl — and long before the CGI upgrades and Han-Greedo dilemma, Star Wars was released with multiple sound mixes. So, will the real Star Wars please stand up? Some might suggest — as Ben Burtt has — that the 1997 redux version represents the most complete sound mix to date with every line of dialog, foley hit, sound effect, and music cue created for the film. But what about the more nuanced differences between home and theater presentations? Can a music or sound effect sting pack the same wallop at home as it does in a THX certified auditorium? More importantly, how do these changes in exhibition affect the film experience? To help facilitate a broader discussion of this phenomenon, I believe we need to consider Altman’s “cinema as event” thesis. Even if we do not engage with the social dimensions of his platform, it is important to ask if a film text is a singular entity. We are conditioned to speak about films as singular texts. We tell our friends that we went to see this film or that film, not a version of that film. To some, these variations are very minor and do not intrinsically change the nature of a film as text. But, as Altman contends, if we claim to understand the technical and cultural implications of a film, then it is important to consider the ways in which multiple versions contribute to this discussion. The “cinema as event” thesis affords us a more general flexibility to tackle this issue. It also provides a means by which we can discuss more dramatic changes to films. Here I am referring to the process of renewal that we know as “remastering.” When E.T. : The Extra-Terrestrial was being prepared for its DVD release in 2002 Steven Spielberg remastered the original print, added some material, and (infamously) removed other material, including the replacement of guns with walkie talkies in the hands of the government agents. Some have reported that the line about Mike not being allowed out on Halloween dressed as a “terrorist” was changed to “dressed like THAT” in the VHS release from 1988 and “dressed like a hippie” in the 2002 theater/DVD release. 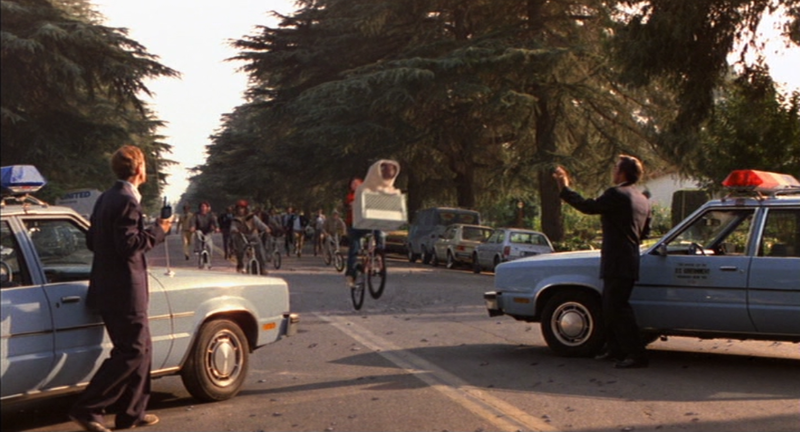 (Note the compositional changes in the two frames below: Elliot’s head and E.T.’s basket have also been repositioned). As such, it becomes harder to differentiate among versions when filmmakers and studios prohibit earlier versions from being distributed. 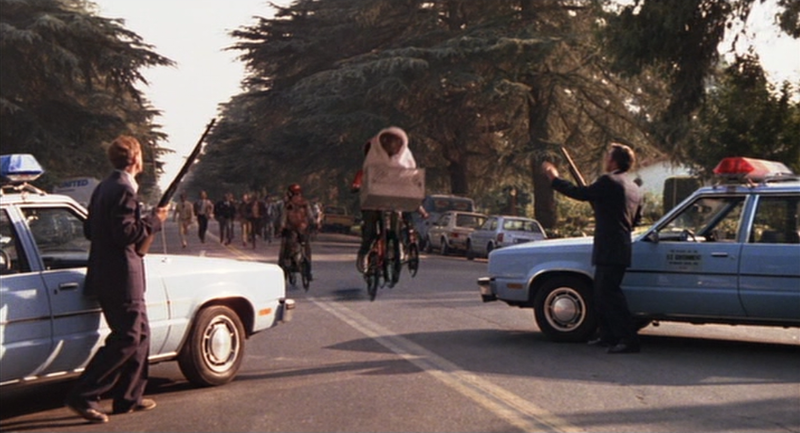 In an eleventh-hour decision by Spielberg, the 20th Anniversary E.T. DVD set also included the original 1982 theatrical version. Many applauded this decision because it provided audiences with the option of experiencing Spielberg’s first “draft” or his latest draft of the film. This is a trend that has continued with the releases of multiple versions of Blade Runner and Touch of Evil, but many fans of the Star Wars saga are still clamoring for a yet-to-be-released “original” version of the first trilogy. I’m sure there are countless other major and minor examples of films that have been irrevocably changed, where original versions remain unavailable on video or extremely rare. Trey Parker and Matt Stone have made it clear that they believe these works of popular art belong as much to the fans as to the filmmakers who created them. 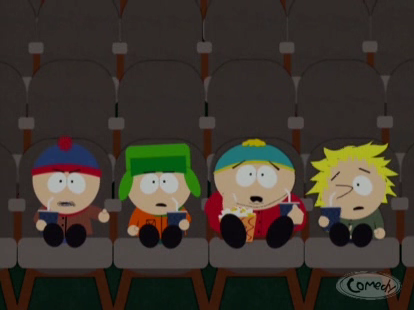 In a South Park episode titled “Free Hat,” Cartman and the gang learn that George Lucas and Steven Spielberg are planning to release a remastered version of Raiders of the Lost Ark in order to “improve history.” Parker and Stone mock the “re-re-re-release” strategy of studios and filmmakers with send-ups of Saving Private Ryan (the word “Nazi” is replaced with “persons with political differences”) and The Empire Strikes Back (where all characters were replaced with Ewoks). Traveling to Skywalker Ranch to confront Lucas and Spielberg, the boys plead with them not to tamper with Raiders. Parker and Stone essentially argue that the film belongs to the world and to change it would mean changing history and memory: “movies are art and art shouldn’t be modified.” A very recent episode of the series suggested that Lucas and Spielberg “raped” Harrison Ford and, by corollary, the boys for having Indiana Jones meet interstellar beings in Indiana Jones and the Kingdom of the Crystal Skull. I have outlined two approaches to the study of multiple versions; one considers the technical differences between mixes and presentations, and the other considers the cultural impact of the altered, er, “remastered” version on the movie-going experience. They are very different approaches, since the more fine-grained model requires the critic to be mindful of different material conditions as opposed to obvious content differences within a film. Both, however, demand critics and scholars to be more precise about the definition of a film as a text or an event. To help facilitate discussion on this topic, I don’t believe it is necessary to point out an appropriate method by which to release or “restore” a film. I sympathize with those who feel utterly betrayed by filmmakers who change their films. To take a macro view of this trend, we should consider that perhaps we experience approximations of films that change over time. I doubt that even directors and editors experience their films in the same way from venue to venue, year to year. As a film student this can be incredibly frustrating. One of the chapters of my Master’s thesis was devoted to the innovative sound design of Apocalypse Now. Right in the middle of my research it occurred to me that my analysis could be deemed completely subjective and baseless since I was hearing the film in my home, on DVD, in an audio format that did not exist in 1979 (5.1 Dolby Digital). How could I honestly write with authority about the movement of sound, the spatial dynamics of sound, and the textures of the sound track when I was hearing an altogether new mix? This is a question plagued by many film scholars who give themselves the job of historicizing the technical and aesthetic qualities of cinema. To study early Technicolor (as Scott Higgins has admirably done) or sound design in the 1970s requires a caveat: material conditions change. Can we productively analyze Technicolor stock qualities based on a remastered DVD of Gone With the Wind? How about the study of mise en scene using a full frame copy of Blow Out? If we tow the party line of film studies, then there is no real difference. A film is a film is a film. But we know better, don’t we? Posted on November 11, 2008 May 17, 2014 by Benjamin Wright	Bookmark the permalink. Interesting E.T. screen caps. I can understand Spielberg wanting to get rid of the guns, but why change the position of the other kids? What does that serve? Its funny that you wrote this post right while I’m considering getting the new Star Wars boxset that came out for Christmas. So apparently this boxset has the theatrical “originals” (the version minus “Episode IV: A New Hope”) but now that you mention that 1997 supposedly has the best sound mix, I don’t know what to think! I just want my old Boba Fett voice back!! In terms of different “versions” of the same film affecting our experience of the movie, I was greeted by one such occurrence when I bought The Lawnmower Man on DVD. It had been a few years since I had seen it again on the SciFi channel and when I saw the DVD in the store, I was excited. Mind you, there was not any mention of “remastered” or “director’s cut” anywhere on the packaging, save for the usual special features and deleted scenes. I later realized that Stephen King, who was credited with the short story upon which the film was based, removed his association with the film and therefore, altered the structure of the film. It wasn’t until a few years back that, as a laserdisc enthuisiast, I found the unrated version, still bearing King’s name and the film played out exactly as I remembered it–much better than the altered DVD. In my opinion, the original version is a much better film than the newest on out on DVD. I wonder if such films will receive the E.T. treatment of the ‘before’ and ‘after’ because I feel that to be a shame of a once decent film sliced and diced into a B-style sci-fi horror. The only other film that comes to mind that I still have yet to determine different endings, is 1994’s The Shadow, with Alec Baldwin. Again, another easily forgettable film, but I do believe the ending I saw on VHS when our family rented it is different than what has been shown on cable and also on laserdisc. Though the film tanked, I think the ending I feel to be the true ending had a better poignance than what I’ve recently viewed. I’d like to be proven right or wrong on this…someday at least. I love the all-encompassing approach this article takes to the cinematic experience, something I think not nearly addressed enough in the study of the medium. You can analyze something frame by frame, forwards and back, but all that really counts is how it plays out from start to finish, unbroken, in a dark room (I feel a bit of Annie Hall coming on just now). With VHS though, an entire generation’s film experiences were guided not only by the opportunity to see anything at home, but also to record material off of television — shows, news, movies, anything — for reviewing. We take it for granted now, but the godsend that created is with us to this day. Among my most prized film possessions is my original VHS recording of “The Terminator” from the Sci-Fi channel — I NEED to get it copied to DVD. I love Cameron’s film to death, but equally important is this version with its snippets of commercials mostly cut out, awkward film edits and, yes, even the pan and scan frame has its charms these days. It’s no longer my favorite film, but we can all get nostalgic about those things that got us started on our life path. Excellent point Rob! I will never get rid of my broken down VHS tapes of Twin Peaks. They stand as a testament to my family’s love of the show because we took the time each week (for years!) to sit by the TV, remote in hand, and record the show without any commercials (even rewinding when necessary to tape over the 60 seconds of commercials that accidentally made their way on the tape.) I can’t count the number of times I watched those tapes. We were constantly trading them amongst ourselves and using them to introduce our friends to the awesomeness of Twin Peaks. Will the next generation have similar experiences? Or will it die with us? Rick — I didn’t know about the Lawnmower Man incident with Stephen King; you don’t hear about names being taken off films that far into the process (i.e., once the film has been released!). Rob — I think you’re point about nostalgia is spot on. We all have associations and preferences that are based on our experiences with a film. For me, I can vividly remember watching a worn (home recorded) VHS copy of Superman: The Movie when I was 6 years old. The same goes for seeing Halloween for the first time on WUTV (Buffalo’s Fox station) when I was 9. Part of the charm of Halloween was the awful pan-and-scan presentation. When I bought the film on laserdisc a few years later I felt like I was watching a completely different film.